The charter flight, which was coordinated with the Libyan and Guinean authorities, departed from Tripoli’s Mitiga Airport. IOM provided pre-departure interviews, medical check-ups and material assistance, including clothes and shoes. 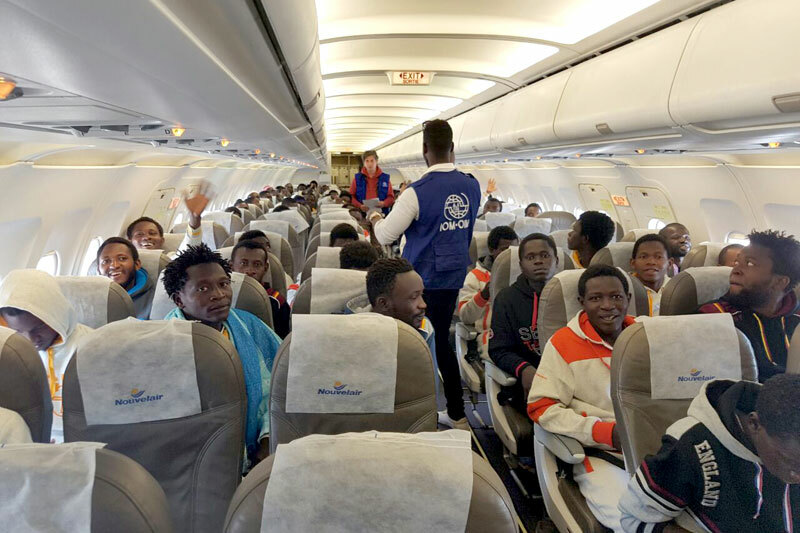 Unfortunately, due to clashes in Tripoli, 51 migrants living in urban areas, who were sheltered by the Guinean-Conakry Embassy for one night prior to the day of departure, were unable to make the flight. These migrants will therefore be assisted to return home via commercial flights as soon as possible. “It was a tense day for migrants and colleagues on the ground but with good coordination with the Guinea-Conakry embassy in Libya and the Libyan authority we managed to support 98 out of the planned 149 migrants,” explained Program Manager Ashraf Hassan. “Thanks to the Government of the Netherlands, the rest of the 51 migrants will be supported via commercial flights as soon as possible,” he added. Among the migrants was also one unaccompanied child. In addition, on 12 March, IOM worked with Libyan authorities to facilitate the visit of embassy representatives from Cote d'Ivoire, Guinea Conakry, Ghana, Niger and the Gambia to Triq Al Sekka detention centre. During the visit, the delegation representatives discussed possible release conditions of their nationals and observed the living conditions inside the centre. During the visit IOM identified 135 migrants who expressed willingness to return to their countries of origin and has initiated the return assistance process. The visit was funded by the European Union and the Kingdom of the Netherlands. The Guinea-Conakry return assistance flight was funded by the Kingdom of the Netherlands and was part of IOM’s return assistance programme. So far in 2017, IOM Libya has helped 1,261 stranded migrants return to their countries of origin. Of these, 304 were eligible for reintegration assistance.